Wildfires are often thought of as catastrophic events that only occur out West. Unfortunately, wildfires are a serious threat for us too. Just drive around the Piedmont and notice the many homes, subdivisions, and communities nestled in mature forest stands. These properties are at risk of damage in the event of a wildfire. While it’s inconceivable to fireproof the forest, residents can safeguard their homes from wildfires by creating a “defensible space” around their homes. A defensible space serves as the front line of defense from a wildfire. It’s designed and managed to suppress wildfires, while giving firefighters adequate working room to defend the home. A defensible space does not have to be devoid of vegetation. Besides looking stark and unattractive, a barren landscape falls prey to soil erosion. Nor should you pave every square foot of space between your home and the woods with blacktop or concrete. It’s not only ridiculous, but impractical. However, the defensible space should not be a tinderbox of dead limbs and other highly flammable vegetation located within 30 feet of your home. To create an attractive, vegetated defensible space, by follow the SC Forestry Commission’s “Three R’s of Defensible Space”. Remove plants from the site that pose a threat to your home, particularly shrubs and trees within 100 feet of your home. Thin out the stand to create wide spaces between the trees. You will decrease the amount of flammable vegetation and create spaces for firebreaks. Excellent firebreaks include open lawns, patios, driveways, walkways, and parking areas. Attractive landscape features, such as water gardens, pools, and dry stream beds also double as barriers to stop or check fires. Reduce the amount of vegetation on the site, such as pruning out dead wood, removing low tree branches within 15 to 20 feet of the ground, and mowing grass—especially if it’s dry. Keep tree limbs at least 15 feet away from chimneys, power lines, and buildings. Replace more highly flammable vegetation with less hazardous plant material. For example, hardwood trees tend to be less flammable than conifers. Consider thinning out a dense stand of shrubs or removing it completely and replacing it with an attractive, irrigated flower border. The area of defensible space will vary depending on the kind of wild vegetation growing near the house and the steepness of the property. However, at least 30 feet from the house keep the area clean of dead vegetation or other debris which can catch fire. This “lean, clean, and green” cushion should contain plants that remain green and healthy during the threat of fire season. Creating and maintaining a defensible space will improve your chances of having your home survive a wildfire. Although you may think: “It won’t happen to me,” let’s hope you’re right. As my mother told me years ago, “its always better to be safe than sorry.” Finally, I understand what she meant. For some, summer is the season for vacations. Fine, but that doesn’t mean that your landscape has to go on vacation too. You can extend the springtime pageantry of colors, flowers, and fragrances throughout the summer with bulbs. Some bulbs require a little attention, while others thrive on neglect. In this entry I’d like to introduce you to a few of my favorite summer bulbs. Dahlias come in nearly every color but blue on stems that range from a foot high to over 5 feet. Their head-turning flowers range from soft peony shapes to spiky cactus shapes. Pom-pom dahlias produce tight balls of tiered, rounded petals, while others look like daisies or anemones. I‚m especially fond of ‘Bishop of Llandaff’ which grows two to three feet high with burgundy-black leaves and garnet red anemone-type flowers. For competitive gardeners, grow the mammoth „dinner plate‰ dahlias with six to 9 inch wide flowers, such as ‘Thomas Edison’‚ (purple), ‘Kelvin Floodlight’‚ (golden yellow), or ‘Garden Wonder’‚ (red). For looks and fragrance I turn to lilies with flowers that come in several colors: red, yellow, orange, pink, lavender, cream, white, and purple. They range in height from 1 to 6 feet. For starters I recommend Asiatic lilies, Easter lilies (you planted your potted Easter lilies outside, didn’t you? ), and the late summer to early fall-flowering Formosa lilies that bear fragrant, off-white funnel-shaped flowers in a candelabra-like display. Pineapple lilies, particularly ‘Sparkling Burgundy‚ with its intense reddish-purple leaves, has been a reliable performer for me.. With anticipation I look forward to the miniature purple pineapple flower bud rising a foot or two high and watch it open gradually to reveal a a spike of white flowers. Crinums or swamp lilies are the quintessential summer bulb for southern gardens. In the spring bold green leaves sprout from underground bulbs (some attain the size of grapefruits) to create a fountainlike haystack of straplike leaves. In the summer clusters of lilylike flowers appear on three foot tall stalks in colors that range from white, pink, or striped (“milk and wine lilies”). Several common varieties include ‘Ellen Bosanquet’ (red), ‘Cecil Houdyshel’ (deep pink to red), and C. x powellii ‘Album (white). The Orange River lily (C. bulbispermum) is well-suited for wet areas (“hog wallows”); it blooms in the Spring and sporadically though the summer and fall producing white, pink or striped flowers. More hard-to-find cultivars worth seeking out include the purple-leaved ‘Sangria’ with deep wine-pink flowers and ‘Regina’s Disco Lounge’ with large pale pink-white flowers with a darker central stripe to each lobe. Depending on the cultivar, crinums may bloom one time or sporadically throughout the season. To see these and hundreds of other crinum species and hybrids, visit Riverbanks Garden in Columbia. Summer bulbs cultivated for their big, bold leaves include the elephant ears or colocasias. Growing three to five feet in height, these cultivars are grown for their colorful stems and leaves: ‘Black Beauty’, ‘Blue Hawaii’,‚ ‘Hawaiian Eye’,‚ and ‘Lime Aide.‚ For an eyecatching accent plant, conversation piece, and quick summertime shade, grow Jack’s Giant Elephant Ear. This colocasia introduced by Jack de Vroomen of Greenwood, SC, reaches a height of seven feet and produces umbrella-sized leaves with wavy margins. These are just a few of the many summer bulbs that will invigorate you and your landscape without having to take a vacation. No matter how you slice it, there is no summer without watermelon. Royal Sweet or Icebox, seeded or seedless, I’m not finicky about watermelon. According to USDA estimates, each American consumes about 15 lbs. of watermelon a year. By July, I’m way ahead of that mark. Because July is National Watermelon month, according to joint resolutions passed by the U. S. Senate and U. S. House of Representatives in 2008 and 2009, respectively, I feel that must support the consumption of this delectable fruit. 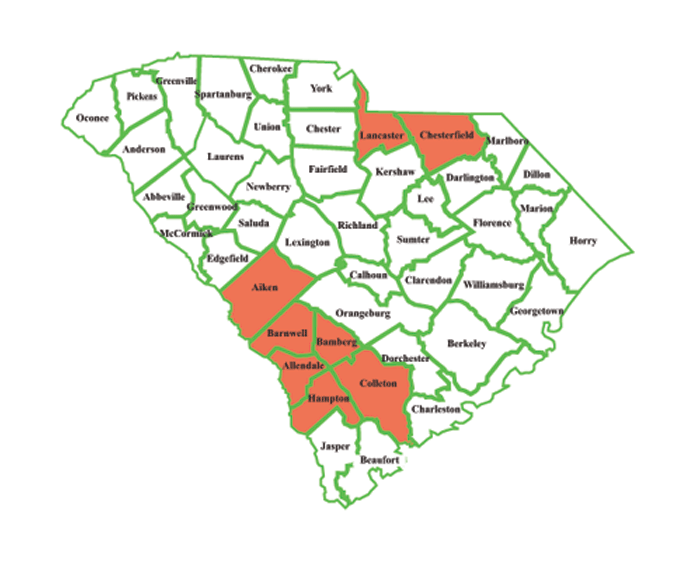 Leading watermelon-producing counties in SC. Credit: SC Watermelon Board and SC Watermelon Assoc. Watermelons can be cultivated in any home garden in South Carolina, however, major commercial production* is concentrated in counties in the Sandhills and Lowcountry, notably Aiken, Allendale, Bamberg, Barnwell, Colleton, and Hampton counties. Chesterfield county leads production in the Piedmont. Most of the watermelons are seedless, which comprise about 70 percent of the melons produced in South Carolina. I do like the convenience of seedless watermelons, but I miss the crunchiness of the seeds and the opportunity to show my kids that their dad may be old, but he can still spit a watermelon seed farther than them. Have you ever wondered where the seeds of seedless watermelons come from? Seedless watermelons were first developed at Kyoto University, Japan in 1939. The parents are two seeded varieties. The male is a diploid variety, that is a watermelon with the ordinary number of 22 chromosomes. The female parent, however, is a tetraploid variety, one that has been treated with colchicine to double the chromosome number to 44. The resulting hybrid seed is a triploid with a chromosome number of 33. Although these triploid seeds will sprout, the resulting watermelon plant is sterile. The vine flowers and makes fruit, but these fruit are seedless. ‘Citation’ watermelon. Credit: Sakata and National Garden Bureau. Breeders select diploid and tetraploid parent lines separately for desirable traits, such as taste, flesh color, size and shape, rind thickness, productivity, maturity time, and others. Once the parent lines breed true, that is the offspring exhibit consistent traits, which may take ten generations–the crosses are made. As a group seedless watermelons tend to keep longer in storage since there are no seeds to serve as focal points for the decay. Growing seedless watermelons is somewhat more challenging than raising ordinary watermelons. Seed of the latter will germinate at 75 degrees. 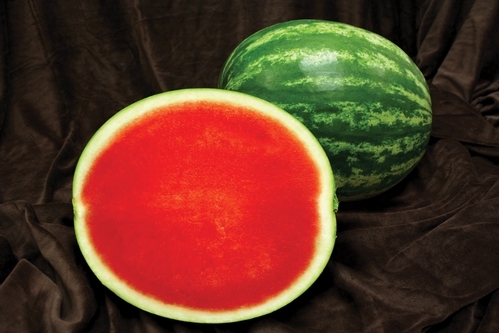 Seedless watermelon seeds, by contrast, need at least 80 degrees and preferably 85 degrees to sprout. The thick seed coat sometimes sticks to the cotyledons on the emerged seedlings requiring them to be carefully removed by hand, though sowing the seed so that the pointed end is down reduces this seed coat-sticking problem. Seedless watermelon flowers must be pollinated to set fruit, but because the plants produce no pollen of their own, a seeded watermelon variety must be grown nearby. When you buy seedless watermelon seed, a few seeds of another variety are typically included. Plan on growing one of these seeded plants for every three seedless ones. These seeded watermelons will set fruit of their own, but these are usually selected to have a different shape or rind color to make it easy to distinguish the seeded and non-seeded fruits. To learn more about watermelons, check out the National Garden Bureau’s 2013: Year of the Watermelon. *Commercial watermelon producers should come to the Edisto Watermlon day on July 10. To water or not to water the lawn: that is my question. As we enter the third week of summer, gardeners are faced with that age-old question: To water or not to water the lawn. (1) water the grass to keep it green or (2) don’t water and watch the lawn turn brown and dormant. If you chose is not to water your lawn, don’t let the dead brown leaves frighten you. The lawn grasses have gone dormant. Grass plants possess buds in their crowns and rhizomes (underground stems) that may remain alive and grow when more favorable conditions return. Tall fescue is an exception because it has no means of escape. Three weeks or more without rain in the summer can injure or kill tall fescue. Nevertheless, any bare areas that arise can be easily repaired in the fall with seed or sod. If you choose to irrigate your lawn, it’s important that you water efficiently: water the lawn when it exhibits drought stress symptoms; apply an appropriate amount of water; and water at the right time of day. A “thirsty” or drought-stressed lawn develops a bluish-gray cast that turns back to green when the lawn is watered; footprints stay in the grass after you walk over it; and leaves become wilted and rolled. To prevent the lawn from going dormant, apply about one-inch of water to your lawn; this amount wets most clay soils to a depth of 6 to 8 inches. If all of this amount cannot be applied at once because water runs off the lawn or puddles up, then apply one-half inch at a time. Allow the water to soak in before continuing. If you have a portable sprinkler move it frequently to avoid runoff—unless you don’t mind watering your neighbor’s lawn. Place several equally-sized coffee cans or other straight-sided, flat-bottomed containers randomly throughout the area to be irrigated. For above-ground, portable, hose-end sprinklers, arrange containers in a straight line away from the sprinklers to the edge of the water pattern. Turn the irrigation on for 15 minutes. Turn the water off, collect the cans and pour all of the water into one of the cans used. Measure the depth of water you collected. Calculate the average depth of water by dividing the total amount of water in inches by the number of cans. For instance, if the total depth was three inches, and you used six containers, then the average depth would be 3/6, or 0.5 inches. Multiply the average depth by four to determine the application rate in inches per hour. For example, one-half inch multiplied by four equals two inches per hour. If you run the system for one hour, it will apply two inches of water; run it for half an hour, and it will apply one inch. If, during irrigation, water runs off the lawn, apply a half-inch, stop the system and let it soak in, then apply more. Water late at night or early in the morning when dew has already formed. It will not encourage disease outbreaks and it will save you money. For example, at midday, in hot, dry and windy weather, 30 percent or more of the water evaporates. Watering at night cuts evaporation in half, to 15 to 20 percent. Since it takes 640 gallons of water to irrigate 1,000 square feet with one inch of water, late night watering gives substantial savings in cost and in the amount of water you apply. So however you answer the question this summer–to water or not to water the lawn –stick with it. Flip-flopping between the two can weaken and injure your lawn. Photo collage courtesy of: Nicole Ward, UK Cooperative Extension. 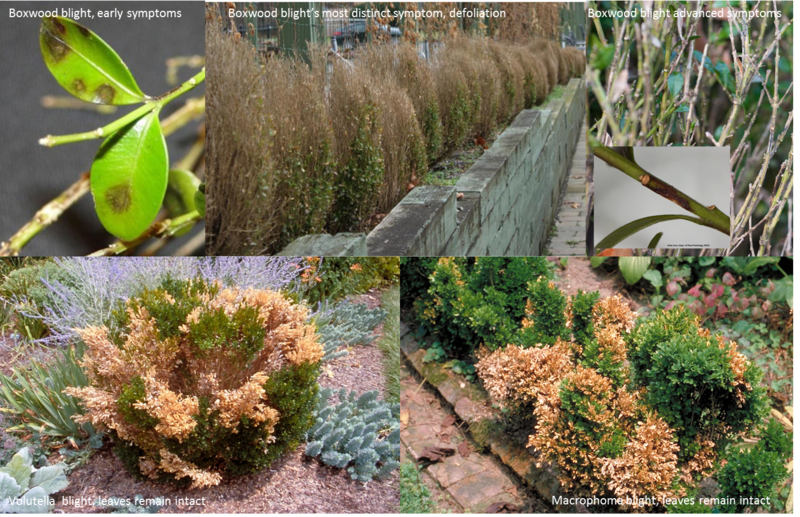 Boxwood Blight (also known as Box Blight) is a devastating fungus disease that affects boxwoods (Buxus spp. ), although some species and cultivars are more susceptible than others. English boxwood (Buxus sempervirens ‘Suffruticosa’) and American or common boxwood (B. sempervirens) are highly susceptible to boxwood blight pathogen. There are no known resistant cultivars; however, tests at North Carolina State University have found B. sinica var. insularis ‘Nana’ and B. microphylla var. japonica ‘Green Beauty’ to be tolerant. The boxwood blight causal organism, the fungus Cylindrocladium pseudonaviculatum, only attacks the above-ground portions of boxwoods and not the roots. Infected leaves develop light or dark brown spots or lesions. These spots can coalesce and entire leaves turn brown or straw-colored. Eventually the “blighted” leaves drop. Infections on the stems result in dark brown to black lesions or cankers. When these cankers coalesce, the stems become girdled and die. The pathogen survives in diseased tissues—including leaves that have fallen to the ground and cankers on stems that remain attached to the plant. The fungus spreads by splashing water caused by irrigation or rainfall. Pruning also can contribute to movement of the pathogen. Long distance dispersal is facilitated by the transport of infected nursery stock and plant debris. Wind apparently does not aid in dispersal of the spores over long distances. Boxwood blight can be confused with other boxwood diseases and disorders, such as Volutella blight, Macrophoma leaf spot, boxwood decline, and winter injury or sunscald. Please be aware that boxwood blight has been found in nurseries and landscapes in North Carolina and just recently in landscapes in Georgia. (See Boxwood blight found in Georgia; The disease has been confirmed in two residential landscapes in the Buckhead area of Atlanta | July 10, 2014 by Jean L. Williams-Woodward, UGA Extension Plant Pathologist). Therefore, folks in South Carolina need to be on the lookout for this new disease. If you observe symptoms on your boxwoods, it is important to have the disease accurately identified by a specialist. For more information, contact your local County Clemson Extension office or the Department of Plant Industry (864.646.2140). From a legal standpoint, the tomato is a vegetable. More than 100 years ago this question was litigated in the courts, according to Michael S. Heard in his paper titled “The Tomato: Fruit or Vegetable? A Nonhorticulturist’s Perspective” (July/September 1996 issue of HortTechnology). On Feb. 4, 1887, an importer named Nix brought a case against one Mr. Hedden, a collector of the port of New York. Nix, the plaintiff, wanted to recover the duties he paid on tomatoes that he imported from the West Indies the previous year. Nix argued that tomatoes were fruit, thus exempt from a tariff. Hedden, the defendant, considered tomatoes vegetables and followed the regulations of the 1883 Tariff Act, which imposed a duty on vegetables, but not fruits. The court had to decide if the tomato was a fruit or vegetable according to the 1883 Tariff Act. Both parties used dictionaries to prove their cases. Nix’s counsel read the dictionary definitions of fruit and vegetable. He followed with a definition of tomato, proving that it was a fruit. Hedden’s counsel countered with dictionary definitions of pea, eggplant, cucumber, squash and pepper. Nix closed with dictionary definitions of potato, turnip, parsnip, cauliflower, cabbage, carrot and bean. The court ruled in favor of Hedden by declaring the tomato a vegetable. Nix appealed. Justice Gray delivered the court’s opinion: “Botanically speaking, tomatoes are the fruit of a vine, just as are cucumbers, squashes, beans, and peas. When I was recently cornered by a group of truth-seeking gardeners during a lunch break at a symposium, I was asked if the tomato is a fruit or vegetable. I calmly replied, “Yes,” and quickly ducked out in the direction of the sliced tomatoes, salsa and gazpacho.